New dishes include Hyderabadi Beef Haleem, slow cooked beef served with onion seed naan; Duck Seekh Kebab accompanied by a sprout salad and the popular Murgh Nihari, aromatic braised chicken served with fried onion. Other speciality dishes on our menu include our Chatpata Tawa Salad, a salad of masala quinoa, seasonal vegetables, chopped apricot and drizzles of chilli-honey dressing; and Bharwan Mirchi, paneer-stuffed sweet peppers and purple potato. Guests are also invited to try our two spring cocktails; Admiral’s Cut, made with delicate hints of agave and vanilla, and The Viceroy, an intricately prepared drink with subtle flavours of star anise and tamarind running through. For something sweet, there’s our new Nougat Chocolate Mousse adorned with homemade cinnamon ice cream. We’d love for you to try our Spring menu. Email info@jamavarrestaurants.com or call 020 7499 1800. From October, we will open our doors on a Sunday for the first time to welcome guests to The Royal Brunch, featuring an indulgent feast of some of our favourite regal dishes. 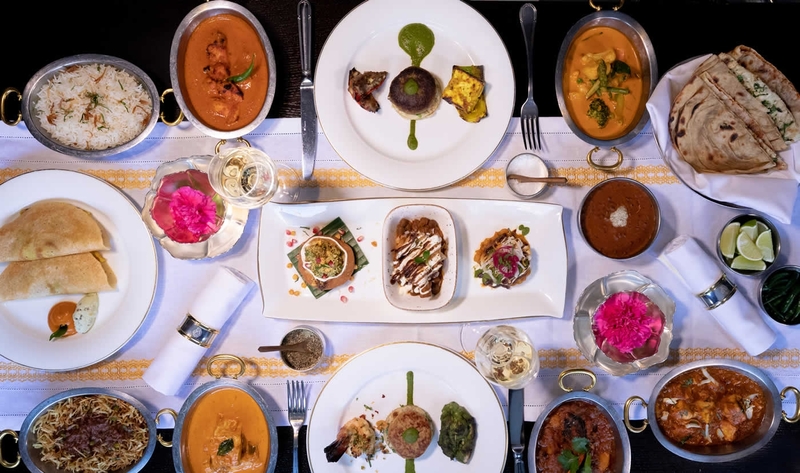 The Royal Brunch is inspired by the opulent, refined cooking of the seven princely states spanning from the north to the south of India: each region's palate is very different, and the royal kitchens would carefully guard their secret recipes. Guests at our Royal Brunch will be welcomed with a glass of Laurent Perrier La Cuvée champagne, before sitting down to an opulent, refined feast, beginning with small, flavourful dishes. These will include a trio of Raj Kachori and Samosa Chana Chaat inspired by the princely state of Bikaner alongside Jamavar’s signature Chandni Chowk Ki Aloo Tikki with honey yoghurt, tamarind and mint chuney to start. This will be followed by a selection from the tandoor including Shahi Galouti Kebab, a velvety lamb pattice with cardamom and saffron, made to a recipe from the princely state of Awadh in the north of the country, and Jheenga Lahasuni, juicy king prawns with brown garlic, cream cheese and yoghurt. For the main event, Executive Chef Surender Mohan has created a feast of Punjab’s famous Murgh Makhani, with Suffolk corn-fed chicken, slow-cooked with gram flour & fried onion; fragrant Salli Kheema with ground lamb, crisp potato thins along with delicacies from Travancore that include Alleppey Fish curry and Masala Egg Dosa. To finish, there's an assortment of fragrant Indian sweets such as Gulab Jamun dumplings and rose syrup, and Kubani Ka Meetha, an apricot and almond specialty from the Nizam's kitchen of Hyderabad. 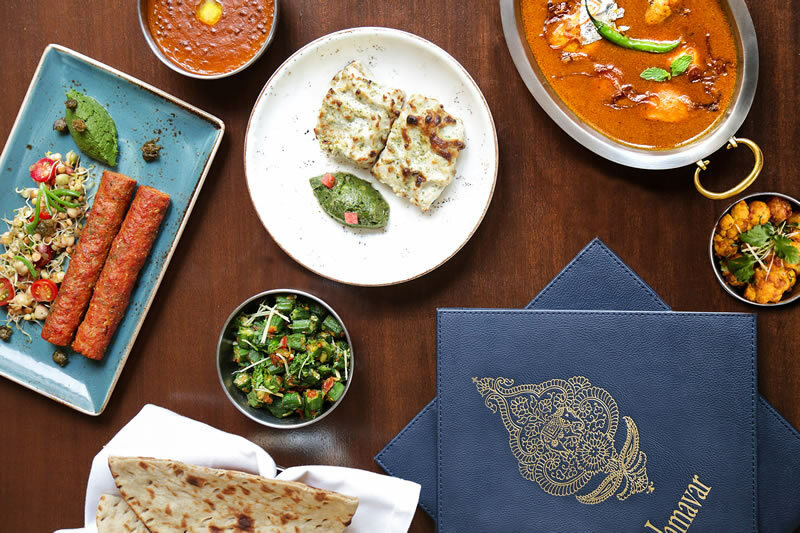 We wanted to bring a decadent yet leisurely Sunday offering to Mayfair - as the English autumn draws in, there's no better way to warm up on a Sunday than with a spiced, aromatic feast. For those preferring to visit in the evening, we will be staying open on Sunday nights for the first time, and you can take your pick from Jamavar's à la carte menu from 5:30pm onwards. The Royal Brunch at Jamavar costs £55 per person, and is available between 12noon – 3pm on Sundays. A vegetarian Royal Brunch is also available. Please email info@jamavarrestaurants.com or call 020 7499 1800.